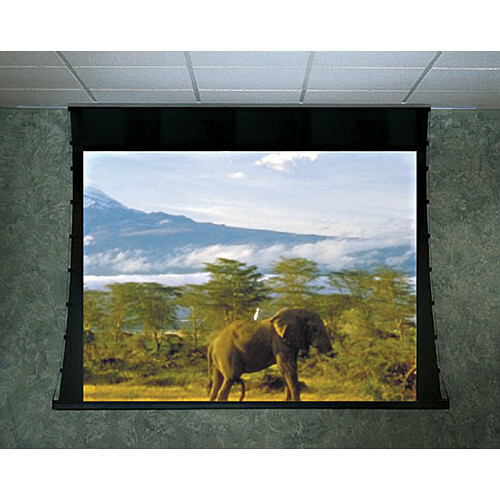 The Draper 60 x 60" Ultimate Access/Series V Motorized Front Projection Screen with Quiet Motor - Ceiling Recessed - Tab-Tensioned - Wall or Ceiling Mountable - Square/Audio-Visual Format (1:1 Aspect Ratio) (Hi Def Grey) features Draper's Tab-Tensioning System, with choice of M1300, M2500 or HiDef Grey viewing surface. The beauty of this screen is that the door of the case retracts into the case before the screen descends. In this way, a touch of total professionalism and "slickness" is achieved. This is an excellent screen for boardroom or lecture hall. Draper products include rear projection display systems, video projector mounts and lifts, plasma display mounts, presentation easels and communication support furniture. Draper products are shipped to dealers throughout the United States, and more than 75 foreign countries. Box Dimensions (LxWxH) 99.0 x 15.0 x 15.0"